RAMSEY – High school tennis coaches constantly tell their players to be confident and take every match one point at a time. They say that so often because tennis is a funny sport. Even when a team is up against a seemingly unbeatable opponent the tide can turn quickly just by keeping the ball in the court. 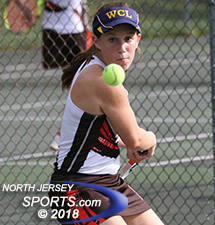 It is what Pascack Hills’ head coach Eric Ganz preached to his both of the Cowgirls’ doubles teams against league rival Ramsey. After dropping both league matches by a 4-1 score, Ganz was hoping to see improvement in their third, and most important, meeting. What he got instead was a magnificent performance down the stretch to lead to a finish that nobody on either side could have predicted. Carly and Samantha Haberfield came back from a set down at second doubles to tie the match and leave it all up to teammates Lindsay Fleishman and Ria Sah at first doubles. Having already fought off two match points and just two points from defeat in the third-set tiebreaker, Fleishman and Sah saved their best for last. 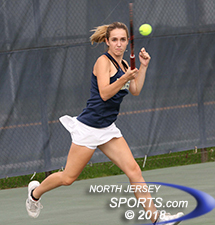 They scored the final five points in the tiebreaker to secure a three-set win and lift seventh-seeded Pascack Hills to a huge upset, 3-2, over second-seeded Ramsey in the North 1, Group 2 quarterfinals on Tuesday afternoon at Ramsey High School. Nina McAllan helped get Ramsey off to a fast start with a straight sets victory at first singles. Fresh off of the first county title in school history, the match seemed to be going Ramsey’s way. That was due to the top of the lineup being so strong from the baseline. County champs at their respective positions Nina McAllan and Katie Moorhead combined to drop just one game as Ramsey (10-3) jumped out to a quick 2-0 lead. The clinching third point proved to be elusive as the Cowgirls scratched and clawed to stay in the match. Maya Schwartz showed consistency by having only a handful of unforced errors in a 6-3, 6-1 win over Nicole Choi. However, the odds were still stacked against the Cowgirls after dropping the first set in both doubles matches. Down a set and playing against a duo who had beaten them in straight sets in both meetings, Fleishman and Sah along with Haberfield sisters dug in and started to flip the momentum by being more aggressive both with the return of serve and at the net. Carly and Samantha Haberfield both put away volleys at the net in the 10th game of the third set to score a break of serve that closed out a 3-6, 6-4, 6-4 win to knot the match at 2. That left the deciding point to the match at first doubles, which was a tight one throughout. Maya Schwartz won in straight sets at third singles for Pascack Hills, which will play West Essex in the semifinals. Fleishman and Sah held a 5-4 lead but it evaporated in short order. Olivia Mack’s consecutive smashes at the net broke the Cowgirls’ serve to take a 6-5 lead and serve for the match. Twice the Rams were one point away from victory but Fleishman and Sah were able to win long rallies to keep the match going before eventually breaking back in the 12th game to force a third-set tiebreaker. A well-placed forehand lob followed by a volley from Mack gave Ramsey a 5-2 lead. Just when it looked like the end for the Fleishman and Sah they were able to find an extra gear. After pulling into a tie, Sah had a nice volley at the net for a 6-5 lead. Fleishman followed with a strong forehand that could not be returned at the net as teammates mobbed them to celebrate one of the program’s biggest victories in the past decade. Pascack Hills (4-4) will hit the road once again on Friday in the North 1, Group 2 semifinals where it will face third-seeded West Essex, a 5-0 winner over Mahwah, in another quarterfinal. Once again the Cowgirls will be underdogs but it is a role that is rapidly growing on them.